Fifteen undergraduate students and staff from Loyola University New Orleans that traveled to Belize last month not only got the chance to visit Mayan ruins and jump off waterfalls in the rain forest, but they got the chance to help run a two-week day camp for young students in the region. Loyola students teamed up with local Belizean co-teachers to help run the camp for more than 250 local primary school students. Each pair of American-Belizean teachers had their own class of 20-25 students and taught math, English, and arts and crafts and helped organize basketball, soccer and volleyball games with the children. Other special events included a Mardi Gras parade celebration and a day of Olympics with several competitions, including track and field, water balloon toss and tug of war. They also visited their co-teachers’ homes while experiencing the “culture capital” of Dangriga Town and spent time meeting family and friends. The volunteers spent the spring semester preparing for the trip. They learned about the Belizean culture and the people they would learn from and serve with. They raised money through fundraising activities, and they participated in local community service projects to build their community. The two goals of the program are to serve and to learn. The volunteers served in the Garifuna town of Dangriga and learned from the people and the land as well as of the culture of Belize, the Caribbean and developing world. The Ignacio volunteer Belize 2012 community consisted of: Jasmine Brewer, Nicholas Dondzila, Lauren Imwold, Ashley Irvin, Kavin Keller, David Mann, William Maye, Annie McClure, Cara Quintanilla, team leaders Margaret Liederbach and Carissa Marston. Staff included Eric Walsh, Jocelyn Pierre Antoine, Peter Stewart and director Edwin Madera. Fr. 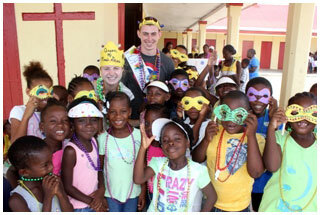 Dziak also spent some time in Belize with the program. For more information, visit http://mm.loyno.edu/volunteer-service/ignacio-volunteer-programs.